Name, age, hometown: Maureen "Mo" Longo, 20, Northbrook, Ill. What corps are you in and what is your role this summer? I'm in the Glassmen, and this will be my second year in the front ensemble. Where I go to school and what I'm studying: I'm studying music therapy at the University of Dayton. Maureen Longo and Chihiro Shibayama, fellow Glassmen pit member. Give us your full drum corps/marching music background. Each year of high school, I did something different: clarinet, bass drum, tenors, drum major. At UD, I've played snare for the past three years. This is my second year marching drum corps in the Glassmen pit, and I also recently joined an indoor line for '06, Gem City HYPE, playing snare. What's your practice schedule like? The challenge is to balance my practice time for corps, private lessons, drum line and ensembles. I like playing as often as I can, even if I have five or 10 minutes between classes. What does your ideal free day consist of? Just the fact that it's a free day makes it ideal. A nice break is always appreciated. Favorite pig-out food: Graeter's Black Raspberry Chip ice cream ... mmm... In the shower you can hear me singing: Percussion parts of anything I've practiced or listened to lately. The last good book I read: The fourth Harry Potter book (I'm working on the fifth one now). The last great film I saw: The fourth Harry Potter in IMAX. Yep, I'm a HP fan ... Jobs I have/have had: I had a lot of random jobs in high school, but currently I'm working as a desk receptionist for my apartment building. It's a nice job – just right downstairs! My favorite TV show: I don't watch much TV at college, but over winter break I got hooked on the first season DVD set of "24." What has been your formative drum corps moment? Finals 2005 retreat. Standing on the field in my uniform, thinking that just one year earlier, I was only wishing to be a part of it -- and thinking how hard I worked to actually make it there. It felt very rewarding and overwhelming. What would you be doing next summer if you were not marching? Working, taking summer classes, and spending lots of time with my family. How did you decide to be a member of your corps? I had planned to audition for a Division II or III corps on snare, but then met a friend at college with a friend in the Glassmen pit, so I decided to go for that instead -- I'm glad I did! What first attracted you to the drum corps activity? A friend in high school marched tenors with the Cavaliers, so my friends and I started going to drum corps shows and I became a fan. I'd always say, "I want to do that," but never thought realistically of the idea. Then, when I came to college, I saw that kids all around me were auditioning for and getting accepted into corps, and it made me realize that I had a chance to do it, too. What advice would you give to young people who want to march? GO TO A CAMP! Just try it -- it's the first step you can take. Even if you don't make it, you'll learn so much in just one weekend. And who knows, maybe you can take what they tell you, improve on it, go back the next year, and make it. What I want to be when I "grow up": I don't want to grow up, but I suppose if I must, I hope to have a career in music therapy, working with little kids with special needs. I'd also want to be doing something on the side that allows me to keep performing music. 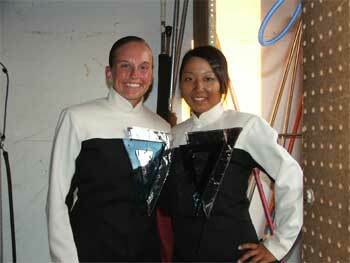 Best drum corps show ever and why: I'm a big fan of The Cavaliers' 2004 show, "007." The year is 2030. What does a DCI show look like? Wow, that's hard to imagine -- I'm thinking more visual stuff that continues to "wow" the audience. Also, hopefully more kids from around the globe getting involved in DCI. Feel free to add anything else you'd like. I was due to be born on May 31, but was born a day late. That one day gives me a whole other year of drum corps! I might even be the oldest marcher in 2007.